Uglyworld #198 - ET Phone Home, originally uploaded by www.bazpics.com. Wage and Ice-Bat managed to find ET on one of the television channels last night and sat watching it in German with English subtitles turned on. Things went well until it came to the famous line "ET phone home" at which point they heard this for the first time ever in German "nach Hause telefonieren". The pair of them were in stitches of laughter at this and wouldn't stop saying it until they nodded off to sleep. 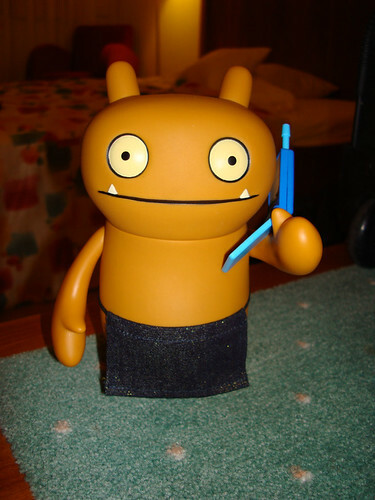 This morning Wage decided to call Babo (who's with Mireille in Aachen) and say it down the phone to him - funniest of all is that Ice-Bat was still lying in bed sleeping but let out a sleep-laugh when Wage said the line to Babo on the phone.